The Israel/Palestine Committee is designed to help JRC’s members, staff, committees, and task forces engage with the many complexities of Israel/Palestine. The Israel/Palestine Committee is meant to play a different role than the previous Israel Programming Committee, and hence was given a new name. We hope this name, acknowledging the interdependence of Israeli and Palestinian history, lives, and culture, opens up space to talk about our many perspectives and relationships with the region. 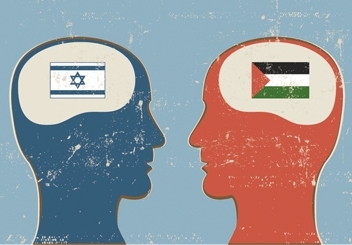 We will collaborate with the JRC community to help develop approaches to enhance learning about Israel/Palestine in different contexts, and in determining when facilitated dialogue might be useful to support each other in dealing with difficult questions. We will work to make JRC a synagogue where people feel safe and excited to explore the complexities of Israel/Palestine. By engaging our varied perspectives, politics, and relationships with Israel/Palestine, we can create a strong community which reflects the reality of our modern Jewish world. For questions, please contact co-chairs Abby Harris-Ridker and Stan Cohn at [email protected]. To help encourage congregants to explore the wide variety of experiences and perspectives surrounding the region, JRC has developed this member-driven calendar of events where JRC members are encouraged to share any local event that they feel might be of interest to other members of the community. Listing of events does not imply endorsement by JRC, and those listing an event also do not have to attend or endorse the event. This calendar is solely for disseminating the wide variety of opportunities available for members to become informed, engaged, and thoughtful about Israel/Palestine. When sharing/writing about an event, please remember JRC’s commitment to respectful and inclusive discourse. JRC members must log in to the member portal to submit an event.